Plastic garden sheds are becoming very popular due to their durability, ease of assembly, and weatherproof construction. Plastic sheds are a cost effective solution to garden storage with the huge advantage that they require virtually no maintenance. 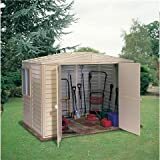 Plastic sheds are sturdy, long-lasting and waterproof allowing you to keep your garden tools, furniture, mower and bikes safe and dry, whatever the weather. In our shed reviews, we consider usage and practicality, weather and UV resistance, ease of assembly, plus we highlight anything we’re not so keen on. This is a great outdoor storage shed that is solid, weatherproof and stable. The 1200 litres of storage capacity provides enough space for a BBQ and folded lawn furniture or a couple of kids bikes (or lots of garden toys). It’s too small for use as a bike shed for adult bikes though. Access is via the lid on top or from two wide opening doors on the front, which makes it easy to get your gear in and out. Assembly is more or less straightforward if you’re used to assembling flat-packed furniture. Keter suggest that two people are needed to put it together, but besides carrying the box in, you can probably assemble it on your own. An electric screwdriver/drill will be a great help. The Keter Store-It Out shed is just the job to store the lawn mower, a child’s bike, and other garden clutter. The assembly instructions could be clearer. Despite the fact you can secure the box with a padlock, it wouldn’t take much to break into it. Rowlinson is a family business that has been manufacturing quality garden storage units since 1926. 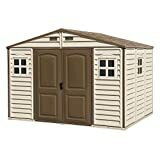 Made entirely from polypropylene, a tough and durable plastic, this shed is hardwearing and will stand the test of time. Ventilation panels provide airflow through the shed, which helps any damp gear stored in there to dry out. Double doors provide good, wide access, meaning that although the shed is compact, you can easily store bulky items such as mowers and kids bikes. The assembly instructions are clear and straightforward, and no tools are required to fit the plastic interlocking parts together. 1 person familiar with following flat-pack instructions can put the shed together in under an hour, but make sure you prepare a flat base to stand it on. 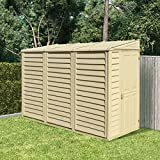 If you don’t need a full sized shed but still require somewhere to store your garden tools and accessories, then this tall plastic shed is perfect. However, it’s also worth noting that Rowlinson make an add-on system for this shed allowing you to extend the dimensions to double the depth if you find you need the extra storage space later on. The shed is quite lightweight, so try to position it out of the wind, ideally against a wall and anchor to a firm foundation. Although advertised as weatherproof, in extreme weather conditions, rain can seep in, so again try to position it in a sheltered area of the garden. Keter is one of the world’s largest manufacturers of plastic garden sheds; they offer high quality products that are practical, affordable and low maintenance. The Keter Factor 6×6 ft shed offers the benefits associated with a resin construction – virtually maintenance-free, and both weather resistant and UV-stabilised, which means that it will not fade over time. The interlocking construction and the integrated floor will keep both wet weather and pests out, whilst the double door opening, window and integral skylight allow some natural light in. The Keter Factor shed is reasonably straightforward to assemble with 2 people, and if you have a firm, level base prepared, it should take less than 2 hours to put together. A tip to ease assembly is to apply some spray lubricant such as WD40 to the joins of the interlocking sections to help them slide together. The door lock is insubstantial so you may feel the need to add a second hasp. Check the shed panels on delivery for any warping, as the shed will be difficult to assemble and won’t sit square if the walls aren’t straight. The BillyOh Retford plastic shed is constructed from high-quality vinyl panels fitted around a hot-dipped, galvanised steel frame making the shed corrosion resistant and maintenance free. The resin is UV resistant so will not fade over time and the shed is weather proof so your bikes, mower and garden tools are safe from the elements. Assembly instructions are clear and assuming you have a firm, level base prepared and a helping hand to hold the panels at the start, this plastic shed can be built in a couple of hours. Given the pent shed design, an excellent feature is the option to be able to fit the door to either end of the shed depending on its position in the garden. The door comes pre-assembled and hooks onto hinge pins which are ready mounted onto the door jambs. The shed also comes with a steel foundation kit, which can either be filled with concrete or fitted with wooden panels for flooring. At 4 x 8 foot, this plastic shed is an ideal storage solution for a narrower garden, or as a bike shed. With the pent design, the shed looks great positioned against a wall. It’s a shame that no floor material supplied to fit the included foundation kit. The Duramax V2 storage shed has a sturdy construction using a metal frame to support PVC panels. The combination of steel and plastic results in a solid structure that gives the impression it will provide many years of service and provide a reasonably safe and secure storage space. Indeed, the shed comes with Duramax’s 15 year warranty. Manufactured from PVC vinyl, it won’t fade or deteriorate over time making it virtually maintenance free. Small windows either side of the door and in the side panels let light in without compromising security. Assembly is straightforward, but as with all sheds you need to make sure you start with a firm, level base. All parts are pre-cut, drilled and numbered for ease of assembly and the flat-pack kit includes all necessary hardware as well as illustrated instructions. With 2 people you should have the shed built in 3-4 hours. Keep in mind though that the Duramax doesn’t come with an integrated base or floor, so if you don’t have a suitable base already, you’ll need to purchase the steel foundation kit. You could alternatively construct a timber foundation, but this will require maintenance. The Duramax 10 foot wide format is ideal as an extra storage space for most gardens or large patios, and its steel frame construction makes it a notch up in terms of sturdiness compared to other plastic sheds. The lack of an integrated base means we can’t give the Duramax shed five stars.